Print the new Meow Mix coupons and stock up on food/treats for your kitty. You can pick up Meow Mix wet food for just 33¢ after coupon at Kroger. -$1 off Meow Mix Wet Cat Food, exp. 4/7/19 (RMN 02/10/19) [2-ct. SimpleServings; (4) Wet Cat Food Variety Pack; (6) Wet Food Single Cups] 33¢ after coupon. -$1 off Meow Mix Wet Cat Food, exp. 4/7/19 (RMN 02/10/19) [2-ct. SimpleServings; (4) Wet Cat Food Variety Pack; (6) Wet Food Single Cups] 70¢ after coupon. 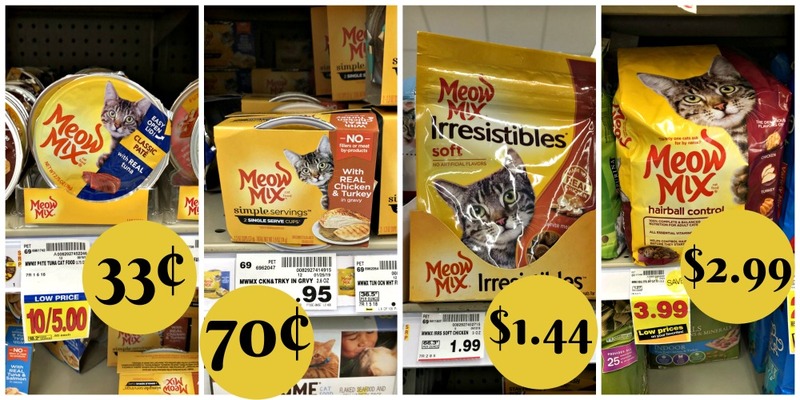 -$1/1 Meow Mix Dry Cat Food, exp. 4/7/19 (RMN 02/10/19) [3.15-lb.+ Bag] $2.99 after coupon.